It's been a while since I've taken to my stall, what with moving to London, working, and getting stuck into new projects such as writing a novel and hosting pop-up restaurant events. If I had to describe this year so far in one word, it would be: productive. And that's how I like it to be. When I heard about the Kent Vegan Festival, which took place in Canterbury this year on Saturday May 7th, I knew immediately that I had to be there. I lived in Kent for many years, and was simply excited that such a thing was taking place so close to home. When deciding what to take to the festival, I opted for something a little different from my usual cakes and cupcakes. I still made brownies...because brownies always go down a treat...but this time, I also had some dried fruits such as dates, mango, and banana. Then, staying true to my brand, I had to have plantain chips as well. I only took a few in order to test the market and sheesh, was I in for a surprise. Not only did they sell out in record time, but I got some seriously amazing reviews on them. So now I know. Next time, I'll be flooding my table with plantain chips. And next time will be sooner rather than later, as I have now signed up to be at the Maidstone Vegan Festival in July, also in Kent, and also very close to home. Aside from being a part of these events, the major plus side is that I get to escape for a couple of days to spend time with my family. 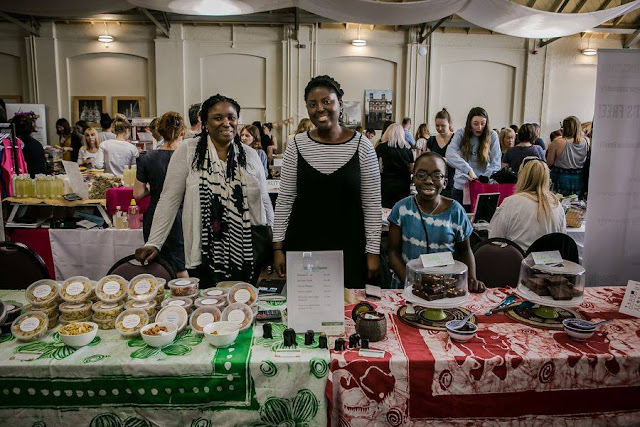 All in all, the Kent Vegan Festival was a wonderful event, full of great stalls and great vegan food. The warm weather and sunshine on the day brought some extra cheer to the event. And I have to tip my hat to the organisers who made it such a stress-free event to be a part of. Well done to everyone involved, and hopefully see you next year!